It doesn't happen often but this morning I've finished my house chores in good time, have little design work to do and find myself at a loose end. Being faced with this moment to myself I decided to make the most of it and drove to Anglesey Abbey for a cup of good coffee and to read a book or two. 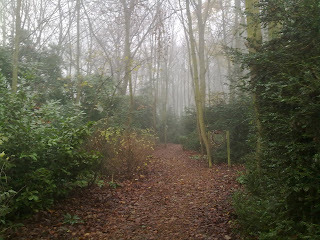 It's a very foggy day and makes the grounds look really atmospheric-wish I'd brought my sword. 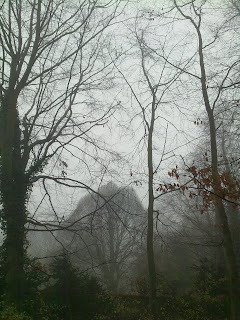 I'd love to practice some iai in this freezing fog in beautiful surroundings. Not sure though. It might spook the silver haired visitors to the Abbey grounds! I find having time for oneself is very important. I *love* being with my family but sometimes I just need a bit of air and time to be with my thoughts. Or even better with no thoughts at all! There's a great chapter in the super little book about zen by Joe Hyams called Zen in the Martial Arts about a fencing master who would have 'do nothing' days. On those days he would not make appointments, reply to calls or even listen to the radio. A good time for him to be comfortable being himself and being with himself. Yesterday on the radio there was an interesting debate about whether 'me time' as an institution or whether really it should be woven into our lives seamlessly so that when we do have calmer moments we can reflect deeply at that point and not need for longer periods of being completely withdrawn from everyone around us. After all we (mostly) live in an increasingly crowded society so getting that 'away' time when you can find absolute solitude is pretty difficult. I suppose that's why I wish I'd brought my sword! Nothing better than meditation through iai on a cold foggy morning. I did satisfy my longing for meditation by walking through the wooded area concentrating on my footsteps one after the other, breathing with each step. This is pretty useful stuff as when done enough you can learn to slow down, calm yourself and meditate anywhere. Looks like a beautiful area! Like you, my family is my world but i still appreciate some 'me time'! My meditation practices have been very infrequent lately and usually consisting of my back yard, a blanket, & me sitting there with my eyes closed attempting to clear my mind with deep breaths and taking in the sounds of nature. Usually this does me well but my problem lies with consistency. As for me meditating anywhere?...still a work in progress. However much we love our families a little bit of solitude now and again is essential in my book. What a great place to spend it! Good luck working on getting meditation into your life!